If you read my last Technolust article recently, you might have noticed something: It's a bit out of date. Three Five years out of date, in fact ...! You also might have noticed there are a few "new kids on the block" in the World o' Steno ... and this article will cover those writers, with some overlap with the first Technolust piece (sorry about that!). 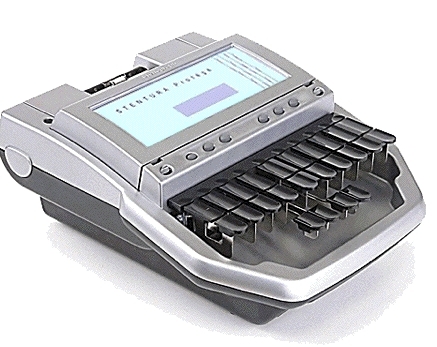 This is Stenograph's replacement for the Stentura 400 ... and like the 400, it has a few flaws ... most noticeably that pesky 50 page limit I've been complaining about for years now ... but I digress. On the plus side, it does have USB connectivity -- as long as you're using Case Catalyst (though the wizards at Advantage Software have managed to reverse-engineer the USB protocol, so the Stentura Protege will work with Eclipse as well over USB). For those of you not using either Eclipse or Case, the Protege comes with a standard serial port. As I said, the Protege has some good points, and some bad points. Not enough information on that screen! If you haven't already, check out the review of my ProCAT Flash for my thoughts on what information should be on the screen ... then you'll understand why I say there's "not enough information" on the Protege's screen. In comparing the .pdf for both the Protege and the Cybra, the Cybra is basically the Protege with one major differnce: No paper. I'll spare you the good and bad list on this one, since they're basically the same machine. The AccuDial contact adjustment system -- very easy to adjust dials. I hear that the regular Cybra's 200 page limit can actually be doubled, simply by switching to single space ... but, that's something I "heard," and haven't had the opportunity to check out myself ... but it sounds plausible! Wonder if the same trick will get the student version up to 100 pages ...? This should work for the Protege as well ...! Those of you who read the original Technolust piece might recall seeing the Stenovations' digitTouch writer ... and the subsequent report that it was being replaced, as the company that produced the technology it was based on was acquired by "a major corporation." What I didn't tell you was that "major corporation" was Apple. Yes, that's right ... the digiTouch technology went into the iPhone and the iPod Touch. So, Johhny Jackson and his design team went back to work ... and came up with the LightSpeed. What's not to like? The writer is light, and from all (well, most) reports, is easier on your body than a regular steno machine. The only negatives I've heard are that the writer takes some time to set up properly, and to get used to ... and then there was one user who reported having serious problems with her thumbs, forcing her to switch to a different writer (think she got a Gemini). Welcome to the Stenovations LightSpeed Forums. As of yet, we are not accepting registration applications, but we will be very, very soon. Thank you so much for your patience. Don't know when that's going to change, but expect it soon! 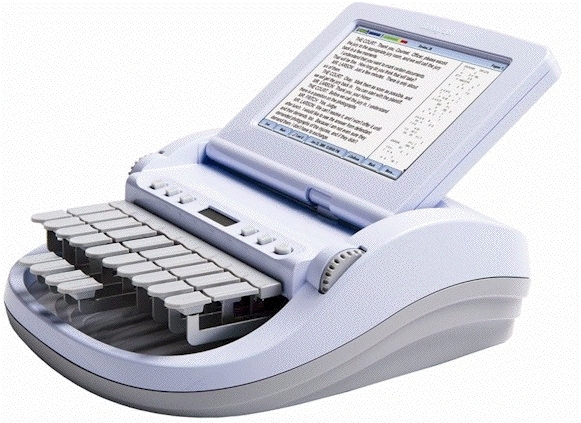 The ProCAT Stylus is ProCAT's answer to Stenograph's A3 Mira and Fusion ... and reporter April Davis just loves it! Paper is optional -- that is, you can either use paper or not use it, and the Stylus will allow you to simply flip a switch to shift from using paper to being paperless. Like the Mira and the Fusion (you did know that ProCAT's writers are based on Stenograph's writers, right? 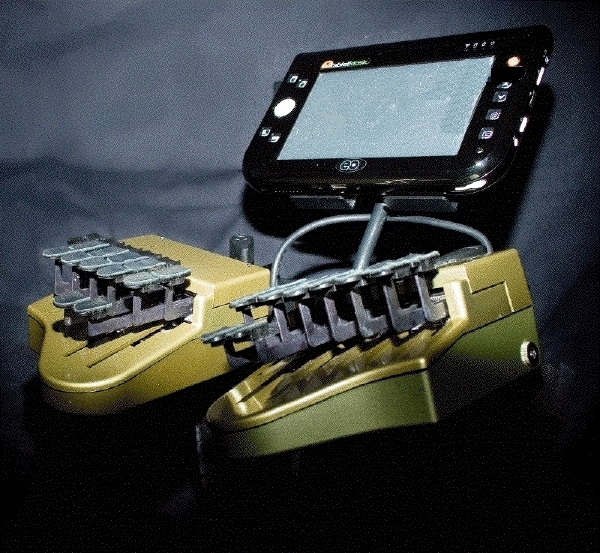 Stenograph mechanics, ProCAT electronics! ), the Stylus has dual batteries -- one for day-to-day operations, and the other as an emergency backup. And speaking of backups, the Stylus has four backup methods: Internal RAM (8 MB, which holds 5,000 pages (one million strokes), two Compact Flash backups, and two SD card backups. 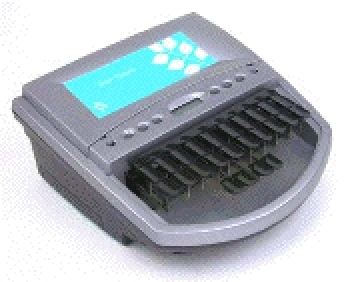 The CF card stores both the translated text and the audio, as well as a backup of SmartWriter-formatted files, while the SD card has a backup of ProCAT Steno files, in addition to the SmartWriter files. The internal RAM is . in backup memory: Compact flash memory cards (available at any office supply store (up to 2GB a few years back; probably more now)), SD card slot for an extra backup method, and on-board flash memory. Alas, I haven't had a chance to test one of these writers personally, but I know they use the same communications protocol that the ProCAT Flash uses ... and if you read my review of the Flash, then you would know that this is the protocol that allows me to start a realtime session in my software, connect my writer to my laptop, and THEN turn the writer on -- and instantly be writing realtime to my laptop. In short, no "Searching for Writer" messages with this protocol. "When other reporters trying to decide between the Stylus and the Mira ask me what I think they should get, my new standard response is this: &apos;If you are still using AOL then you should definitely buy the Mira. If you have worked out the whole Internet Explorer thing, then you can handle the Stylus.&apos;"
Instant Sesitivity Settings: An easy-to-read graphic display shows you the exact position and registration point of each key for perfect adjustments. Depth of stroke and tension can also be adjusted while you write. Attention to Detail: Built-in handles, pencil holders, recessed, side-mounted ports, etc. The Gemini Revolution Grand is light years ahead of the Gemini Piper Charity reviewed sometime back. The big brother of the Gemini Revolution, the Grand is more adjustable and has a softer touch, and has the longest battery life of the Gemini family. If you've bee reading ol' Cheap ad Sleazy for a while, you might remember the e-mail I recieved from a reader I called Annie (as in, Ann Ony Mus), letting me know that the Gemini Revolution was coming (see the 26APR07 update in the Archives). One of the features Annie was most pleased with was the range of the Bluetooth connectivity: about 200 feet, I think it was. The Grand's range: 300 feet. Like the Revolution, the Grand has dual Bluetooth connectivity, which means you can output to more than one computer at a time, if you wish ... both at full Class 1. The Grand includes onboard audio recording, both serial and USB connections, and (depending on options) weighs in from 2.5 - 4.5 pounds. I had a chance to play with one of these recently. I found the touch to be "sneeze-light" ... that is, if you sneezed in the general direction of the writer, chances are good it would spit out "Ladies and gentlemen of the jury"! 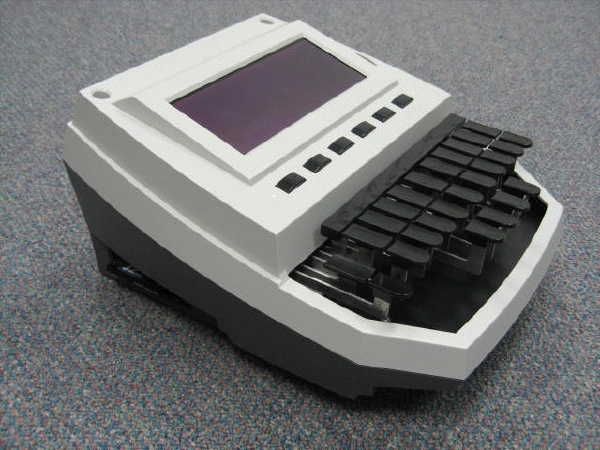 If you've been using a regular steno machine for a while, and find your arms and wrists hurting after using it, then I urge you to seriously consider either the LightSpeed or the Gemini Revolution Grand. Despite the advances in adult stemcell research, I don't see anybody growing new arms or hands for their patients. Say, did I mention that owners of previous versions of the Gemini can upgrade their writers to the new version? No? Sorry about that ... but you can! In the Revolution Grand Catalog, there is a table comparing all the other writers (less the Diamante) to the Gemini. And that was how I found out about the Diamate. Note that the Diamante is not meant to replace the Mira; the Mira line will continue on. Well, okay, so shortly after this article appeared, the Mira line was shut down. Who knew?! 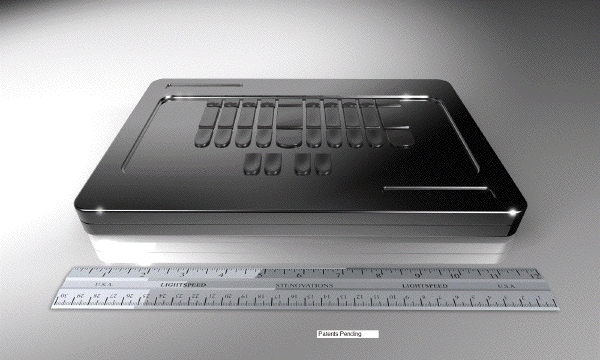 The Diamante's new TrueStroke technology replaces the AccuDial wheels used in the Mira ... which give you less control over the touch! 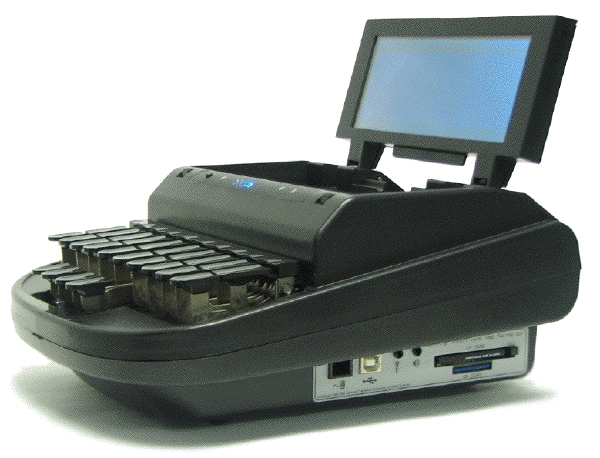 "Ninety percent of our customers never touch their adjustments," a Stenograph sales rep is rumored to have said. Yeah, but ... what about that remaining 10 percent? While the technological method sounds like a good idea, there is no way software can reliably determine which keys you meant to hit or not hit without the ability to individually adjust the key-registration points. Such a solution would most likely require an AI (that's "Artificial Intelligence," for those of you that didn't read enough science fiction when you were younger) approaching parity with the AI depicted in the Terminator movies (well, okay ... so maybe a small dog). I would guess the ideal solution would be a combination of both the AccuDial and the TrueStroke technology ... so maybe, if there are enough complaints, the next generation of the Diamante will have something like that. Sometime back in November of last year, Stenograph released a firmware update that would allow Diamante users to adjust their keys individually. "Dude -- Will there be a student version?" I've heard that a student version is in the works, but right now Stenograph is focusing more on getting the regular version out the door. Another consideration is what to leave out of the student version. Can't leave out color in the display, because a black and white/grayscale display would actually cost more than the color display (color is in demand, so more color displays are manufactured. Fewer requests (for grayscale displays) leads to higher costs ... so no grayscale displays). The 50 page limit is a possibility ... but you already know what I think about such limits. Note that this writer is not shipping as I write this (07SEP09), so curb your enthusiasm! This writer, as you can see in the artist's rendition above, is a combination QWERTY keyboard and a steno keyboard ... with an integrated computer, with a touch screen ... which can run your CAT software. Stenovations president Johnny Jackson announced that his company's next generation writer will be forthcoming around the Christmas holidays. The StarLight, the current code name, will support audio recording, have a touch screen and multiple backup choices. 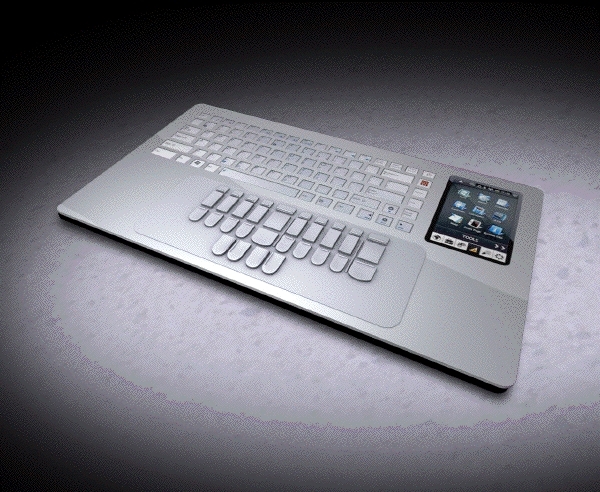 It will have a Windowsï¿½ operating system, which means reporters and students will be able to load their personal CAT software on the writer. The StarLight's weight will be in the range of two pounds, and the height will be an inch at its thickest point. Mr. Jackson stated that anyone who has bought, or will be buying, a LightSpeed from Stenovations will receive 100% credit toward the purchase of a StarLight. That said, like the relationship between the Diamante and the Mira, the new StarLight is not meant to replace the LightSpeed, mostly because "the LightSpeed is not for everybody." Well, that's it ...! These are the newest entries in the steno universe, as of 08SEP09. I wonder what will come next .....?